Police Magnum now in a 3/4 ounce keyring leather-like holster. Super strong 2MM Shu formula at a crazy 17% concentration will stop the most determined attacker. Once sprayed, the attackers eyes slam shut, breathing becomes difficult and he is racked with pain. He cannot continue the attack. This is the best value for your money. The spray is made in the USA at a reliable faciltiy I have used for years. The leatherette holster is well-made, attractive, and hides what's inside. 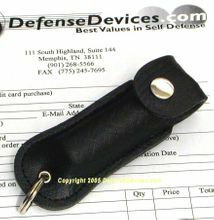 The twist lock top is easy to operate, yet allows quick deployment of the pepper spray. This size produces about ten 1/2 second sprays out to about 12 feet or more. Once used up or when the expiration date is met, you can easily purchase another fresh can to fit the holster. We cannot ship Police Magnum pepper spray to NY, MA ,WI, HI, AK, or APO addresses. Cannot ship pepper spray by air, must choose ground or Priority Mail.